Error 24 play store is common now a days while downloading and installing Facebook and WhatsApp. Due to advancement of technology, use of IT gadgets have now become a routine as well as a necessity. No one is free from android mobile, laptop and computer. A lot of applications are also install on these devices. Therefore, now a days apps and software installation and troubleshooting has become a serious issues. Experts do find a way to tackle their issues and error related to these devices. At present apps installation at android has become a big issue. There are many issues and errors that encounter during installation. One of these errors is “Error 24”. Error 24 on android usually comes during installation of an app on android. However, error ratio is high for WhatsApp installation. This error occurs either during downloading or installation of WhatsApp. First of all Install a file manager as a Root Manager. Now go to internal storage android/data. After deleting com.whatsapp, now go to Google Play and install whatsapp. Second method is to delete all junk file, clear cache and use an application to clear cache, cookies and other temporary files. 1. First of all restart you device. After setting your date and time if required, enable and disable auto-setting of date and time. 3. This issue may also occur due to less space, check your existing internal space availability for requisite app installation. Settings > Application manager > All > Tap Download Manager. Find “Enable” button, tap it to enable Download Manager. 5. Clear cache and temporary files through Settings > Apps > Locate Google Play Store and Download Manager apps > Storage > Clear cache/data. 6. 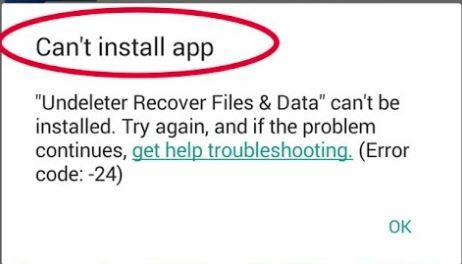 Uninstall already installed app which you are trying to re-install. 7. Problem may also occur due to your “google account” try to add or remove google account. 8. Try to install app from alternate sources. If above method fails to solve your problem then try Method 2.